The castle of Chapultepec is the only castle within North America and was built in 1725 (different sources site different dates) but completed in 1864 after Mexico gained independence, it later housed some of the past presidents of Mexico. The castle sits on top of a hill and you can get really great views of the city below and the Chapultepec park that surrounds it. It is such a beautiful castle and the surrounding area is very pretty and tranquil, ideal place to walk around or just hang out. The castle is one of the top sites to see in Mexico city so of course I had to pay a visit and check it out. I went with Ana's mum (Ana is my hostess here in Mexico and I am living with her family) and we both had such a great time. She hadn't been to the castle in more than 20 years so she was eager to see how much things had changed since then, she was not disappointed and neither was I. To get to the castle we had to walk uphill which wasn't as bad as I thought it would be, from far the castle looks like it sits really high and the climb up appears intimidating but it turned out to be easier than expected. Since Ana's mum is retired she did not have to pay entrance but I paid 65 pesos to get in which is roughly $4 dollars. The palace was really impressive inside and I could only imagine how it must have felt living in it. When I grow up I want to live in a palace, damn it! I took a few pictures of the surrounding areas and the interior of the castle, check them out. These 6 pillars commemorate six young cadets that died fighting American soldiers when there was war between the US and Mexico. At one point the castle was a military school and the battle occurred at the palace grounds. View from inside the palace. Part of the palace grounds, I managed to capture part of it but believe me. The place is huge! Can we take a minute to acknowledge how much weight I have lost? I knew I had lost weight through healthy eating and hitting the gym but I didn't know it was so significant. Looking at my photos I can't believe how tiny I look, yay! to me, I am feeling good and healthy. Check out the bedroom, not too shabby considering how long ago it was designed. I think this was the tea room. We walked around the castle and Ana's mum acted as my private tour guide telling me the history of the castle. That's it folks! we both enjoyed ourselves and I was glad she accompanied me because I learnt more than I would have if I had gone alone. Did I mention how much I love Mexico city? Ana's mum keeps telling me I should stay longer so I can have the opportunity to see more but unfortunately I can't, have to get back to work although I would definitely not mind extending my stay here. Yesterday I had a very interesting encounter that turned out to be such a huge coincidence. 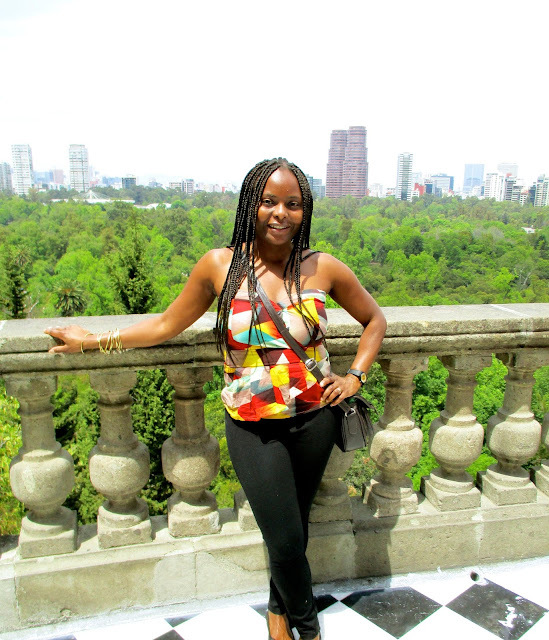 I met a Kenyan girl who lives in Mexico city with her Mexican husband and her name is also Judy. She approached me while I was at a traffic stop and asked me where I was from so I told her Kenya, she was pleasantly surprised and quickly switched to Swahili asking me what my name is and where I live. I was so shocked and even more shocked when she said we shared the same first name. You should have seen us acting like long lost friends. She told me that her husband had spotted me first and jokingly told her that we could be sisters and she should approach me to find out where I was from. She has been living here for 10 years and loves it. We could not chat for long because they were rushing somewhere but we exchanged contact information. Seriously the food here is DELICIOUS!!!! My love of Mexican food has increased tenfold since I got here, I think if I lived here longterm my waistline would be nonexistent. There are several options for public transport here and the network is pretty extensive. You have the metro train, metro bus and regular buses. They are all dirt cheap which makes it so convenient for a lot of people.